In cases with a longer license suspension, the law allows it to be cut in half, from as much as 3 years down to 1 1/2 with the interlock device installed. In addition, Annie’s law will also increase the lookback time in counting prior offenses from 6 years to 10 years. The Nation’s most prominent anti-drunk driving advocacy group MADD (Mothers Against Drunk Driving) claims that stronger ignition interlock laws, particularly those that require the use of IID after any first offense conviction, reduce drunk driving fatalities. Twenty-six states now mandate IIDs in first offense cases, and all 50 states have some time of discretionary or multiple offense interlock requirement. The law will formally go into effect on April 4, 2017. 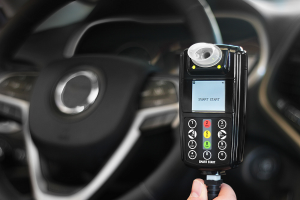 An Ignition interlock is an electronic device that prevents a car from starting without the driver blowing into a tube that tests whether or not he or she has consumed any alcohol. It is set to a very low threshold (.02%BAC) so any alcohol consumed will prevent the car from starting and trigger a warning that could result in further penalties. It is essentially a mobile, rolling breathalyzer. Most devices also require “rolling retests” at random intervals, just in case the person takes a drink after starting the car or has someone else blow into it so they can start the vehicle. Some interlock manufacturer’s devices include a camera to verify that the driver is blowing into the device. If you have a driver’s license restriction that requires you to only operate a vehicle with an IID, you are required to get one installed in your own vehicle (at your own expense) and you can be penalized for using a car without one. Who is Annie’s Law named after? Annie Rooney an attorney from Chillicothe, OH who was killed when her SUV was hit by a drunk driver who’d had multiple drunk driving convictions in Ross County on July, 4, 2013. The driver was sentenced to the maximum penalty of 8 years in prison for a vehicular homicide while under the influence. Annie’s father, Dr. Richard Rooney worked for years to advocate for this bill. 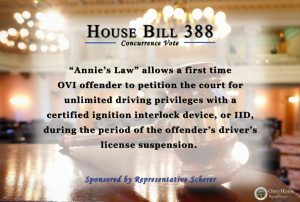 Is the Annie’s Law Interlock Requirement a good deal for OVI defendants in Ohio? It might be. If it reduced the license suspension time and gets you back on the road and back to your life quicker (with an interlock installed in your vehicle), then some people will certainly prefer it to a longer suspension and no ability to drive. If you are unable to get a vehicle installed with an IID, or have to drive a company vehicle where an interlock device is not possible, then it could make the situation worse for you. Especially if you might have previously been eligible for a temporary hardship license. If you are facing a first offense OVI and don’t know what to do next, please call us for a legal defense consultation right away.